The Velocity Vixens is an all female team competing together for the first time at Big White Winter Rally. Michelle Miller will be driving with Tiffany MacDonald in the co-driver seat and Mindi Cross and Tina Watt as their crew. The women are looking forward to a winter adventure like none other at this challenging and exhilarating event. This will be Michelle’s second rally as a driver, as she is usually found sitting in the right seat calling pace notes or instructing at DirtFish Rally School. She has competed in Big White Winter Rally twice as a co-driver with James Rimmer and Sam Albert. “I’m excited to conquer these roads as a driver. Big White is one of my favorite rallies. It’s very beautiful, almost serene as we traverse the twisty roads and changing conditions with everything blanketed in snow. 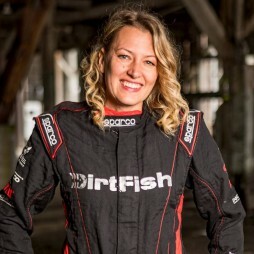 Being in the driver seat will be an exciting new way to see these roads and will definitely help me as a co-driver and instructor, even better understanding the driver perspective.” Michelle will be driving a 2003 Ford Focus in open 2wd class; that she and her husband have been building and racing since 2016. Tiffany started competing in TSD Rallies in 2013 as a navigator and instantly fell in love with rally. She won 1st overall navigator in her class for the 2016 Championship. In 2016, she began co-driving in stage rally and has had the opportunity to run with some great drivers over the last year. In addition to competing, she is currently the Vice President of Rally Pacific Motorsport, and in late 2016 she helped form BC’s newest rally club, Interior Rally Sport Association helping organize and run TSD events in the BC interior. Tina Watt is a working mother and wife who attended the automotive program at Lake Washington Tech. She enjoys her career working as a service advisor. Her passion is to change the stereotypes of women in the automotive industry. Mindi Cross started racing in 1999 in the SCCA Solo program where she earned national championships in 2009 and 2011 driving MINI Coopers. Her background in Solo racing is with diverse equipment including seasons competing in a vintage Lotus Elan and a Mitsubishi Lancer Evolution VIII. Most recently, Mindi has campaigned her own Scion FR-S in the Street Touring Extreme class in both Solo and ProSolo series. She has also been a regular competitor in SCCA RallyCross in her trusty 2001 Ford Focus. As a self-funded amateur racer, Mindi has spent countless hours on preparation and maintenance of her own cars and the team cars she’s co-driven. Mindi’s racing interests as a spectator include Formula 1, NASCAR, and IndyCar. She counts FIA Group B rally legend Michele Mouton amongst her racing heroes and inspirations. You can follow the team’s progress on event live at: https://carsrally.ca/rally-events/big-white-winter-rally/. Thank you to DirtFish, 425 Motorsports and all our friends, families and volunteers for their support.